I’ve been steadily working on an 8 string bass for myself in between other projects. 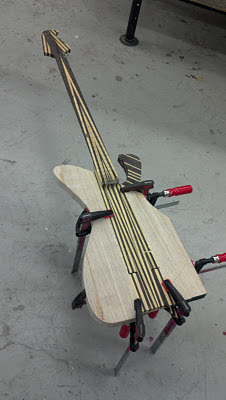 The through-neck has presented some unique difficulties paired with how I’ve been laminating all the pieces. I’ve approached the process fairly intuitively because of this. The geometric pattern top has to be attached separately from the through neck and the ash wings that are being glued on in these pictures. 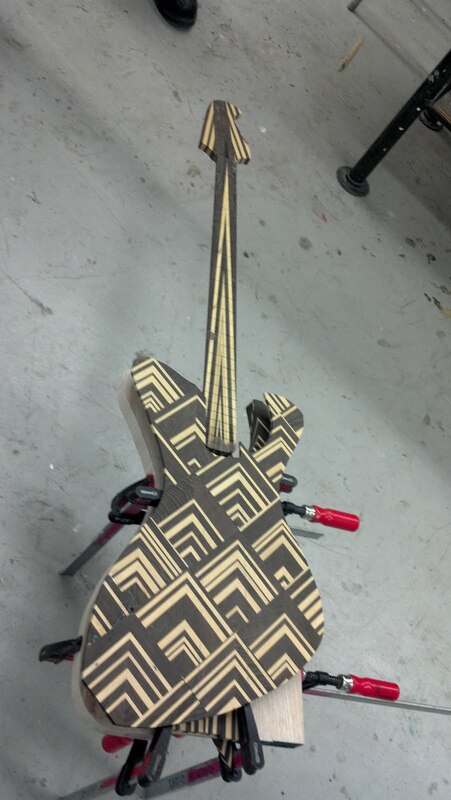 The cutaway arm has a wenge and yellowheart piece laminated on to extend the patten of the top into the rest of the body. I chose that particular part of the guitar because of its visual and physical prominence. The headstock as pictured will have a cap put on it that matches the body’s top.